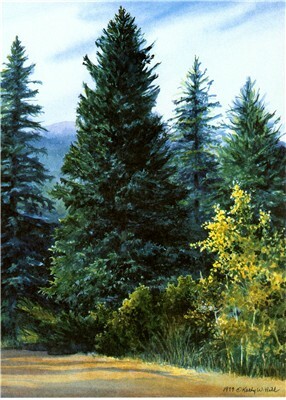 In 1999 a friend of mine encouraged me to enter a competition for the Colorado Holiday Millennium Tree painting. I was a little pessimistic about my chances, since Colorado is overflowing with excellent artists. My friend persuaded me to enter, because the committee was seeking a rural artist. I submitted slides of several paintings I have done that included trees and was selected as a finalist. My husband and I drove to the secret location to view the tree, with a forest ranger as our guide. I took many photos of the tree. When we returned home, I did a quick watercolor sketch to remember my composition, until my film came back. (Before I had a digital camera). My final painting was watercolor. I sent the framed painting to the Colorado Rural Development Council. It was chosen from 4 finalists to represent the project. The painting was used to raise funds to defray the expense of transporting the actual tree to Washington, D.C. where it was displayed on the west lawn of the United States Capitol in the year 2000. The 65 foot, 75 year-old Blue Spruce came off the Pike’s Peak Ranger District of the Pike National Forest, near Colorado Springs, Colorado. The tree was driven from Colorado through Kansas and Missouri, along the historic Santa Fe Trail, reaching Washington, D.C. on December 4th. One of the truck drivers was U.S. Senator Ben Nighthorse Campbell [R-CO], who took special lessons to qualify for a commercial license to drive in the convoy. Sixty-four smaller trees — one from each county in Colorado — were part of the convoy to be distributed among House and Senate office buildings and other governmental offices as a gift from the people of Colorado. Each year the Landscape Architect of the U.S. Capitol selects the official “People’s Tree.” It is referred to as the People’s Tree because our elected officials are an extension of the people of the United States. This tree was selected 2 years prior to being used as the People’s Tree. The location was kept “secret” to discourage vandalism. Seeds were collected from its pinecones and seedling trees were started from those seeds. The seedlings were given away by the Forest Service to commemorate the Millennium Tree. I have one of those seedlings growing in my yard! The tree was decorated by approximately six thousand lights and four thousand ornaments hand-made by Colorado youngsters. The activities associated with making the ornaments provided a learning experience for students about their state, their culture and their historical roots. SHOWCASING OUR STATE: The Holiday Tree was an opportunity to showcase Colorado’s natural beauty and the diversity of products and services we provide the nation. It also provided opportunities for several government agencies to join in partnership throughout the state to provide this Tree to our nation’s Capitol. The Colorado Rural Development Council was asked by the U.S. Forest Service to spearhead the project. Other groups that contributed to its success included the Colorado State Forest Service, the National Park Service, Sangré de Cristo Resource Conservation and Development Council, Inc., Colorado 4-H Youth Development, Colorado Dept. of Transportation, and the Colorado Dept. of Natural Resources. 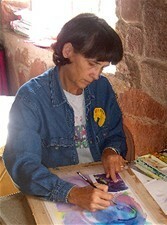 The painting was reproduced as frameable prints, on T-shirts, sweatshirts, posters, notecards, and wooden tree ornaments. I personally signed 3500 prints, to help raise funds for this endeavor. Although I received no compensation for the painting, I did travel to several sites for fundraising events. I would like to thank Donna Jackson for the endless hours she spent coordinating the marketing of the Millennium Tree. And thanks, too, to the late Sam Moore who managed to get the convoy carrying the tree to stop at Lathrop State Park between Walsenburg and my home in La Veta. Although that November morning at Lathrop Park was cold and windy, the warmth of all the people there made it my most memorable day of the entire Millennium Tree experience. The tree was securely wrapped in shrink wrap, laying on the bed of a specially made truck for the trip to the Nation’s Capitol.